Last night our lengthy stay in Cape May finally paid off (not that we expected it would) as we met a great group of young cruising friends! No offense to our older cruising friends, of course, but it was nice to know that people in our age group are sailing. We had a fabulous evening with the crew of Anthyllide, Scott & Kimberly, who are venturing into their seventh year of cruising and the crew of Serendipity, Matt & Jessica, who are embarking on their cruising lifestyle just as we are. 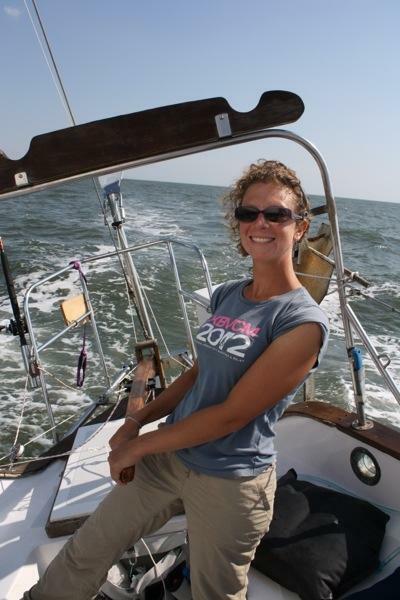 We decided to cruise together through the Delaware Bay as we are all on similar schedules and heading to the Bahamas for the winter. We had a GREAT sail today. The morning started off when Matt and Jessica came by in their dinghy and we headed in to the yard sale at Utsch’s Marina. Steph and I made out really well. I acquired some fishing equipment that I have been wishing I had on the boat, but the big news is that we finally decided to buy an outboard for our dinghy. Our paddles to shore have been getting longer and longer, and we decided it was time. We are now the proud owners of a used but in very good shape Nissan outboard. 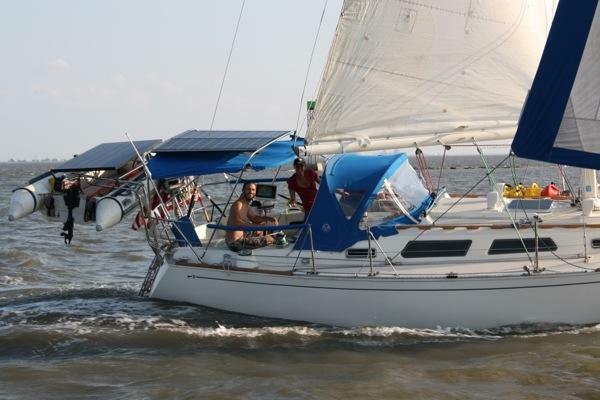 We hurried back to Rode Trip to get our anchor up and we left right on time to catch the current up the Delaware Bay. 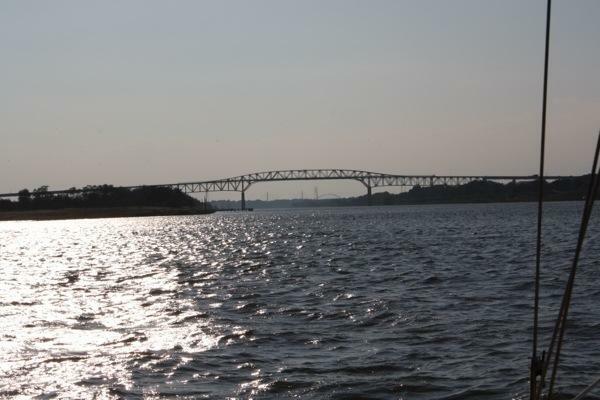 Our first step was to motor through the Cape May Canal. 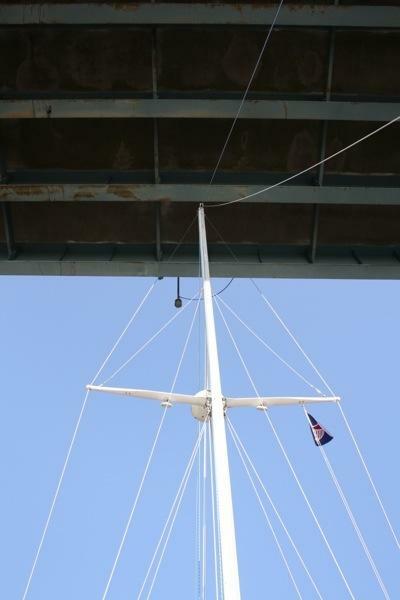 The clearances above the top of our mast were a little closer than we have been used to, but we made it under the fixed bridges with 7 feet to spare. It is very unnerving standing on the boat looking up at the top of the mast. 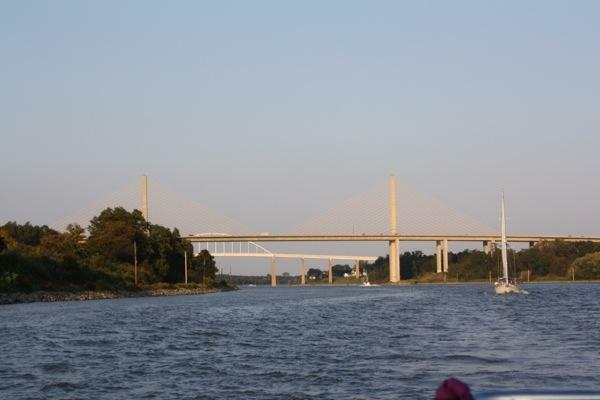 The angle of looking directly up the mast makes it look like the mast is going to hit the bridge every time. Motoring through the canal went very quickly and we raised our sails as we were exiting the canal. Matt and Jessica took the direct route up the bay, while Stephanie and I took a slightly longer track where we headed out until we caught the stronger current near the shipping channel. This was a good decision as we won our imaginary race with Serendipity. Who knew the Wetsnail had so much get up and go!? 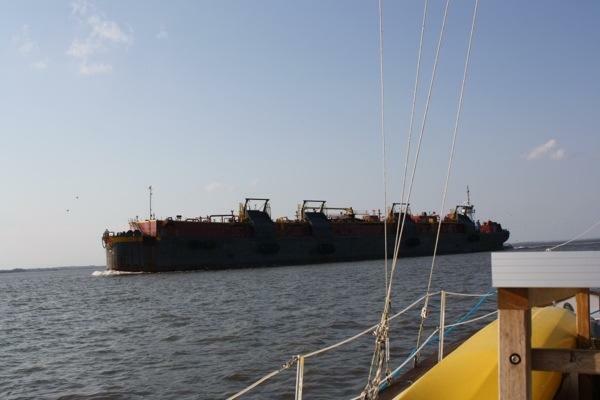 We had a great broad reach up the bay with the current pushing us. We were moving along at 7 and sometimes 8 knots with only small waves. We took advantage of our windvane again and both Stephanie and I were free to move about the boat while keeping an eye out for other vessels. 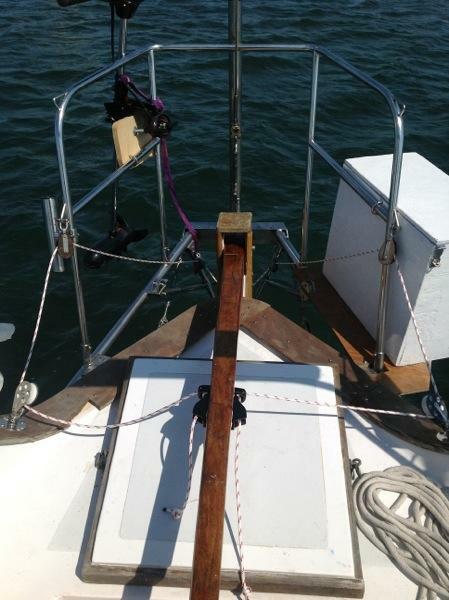 You can see in this picture the control lines rigged to the tiller. We are really enjoying using the windvane instead of hand steering all the time. We aren’t very good at it yet, so it takes a long time for us to “tune” the windvane to actually steer the course we want, but once it is setup it works wonderfully. 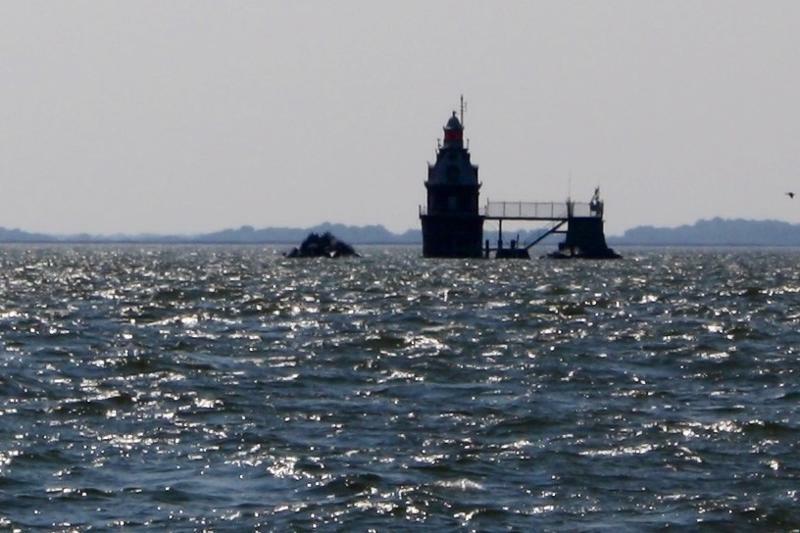 We sailed past the “Ship John Shoal” which has a lighthouse standing on it out in the middle of Delaware bay. 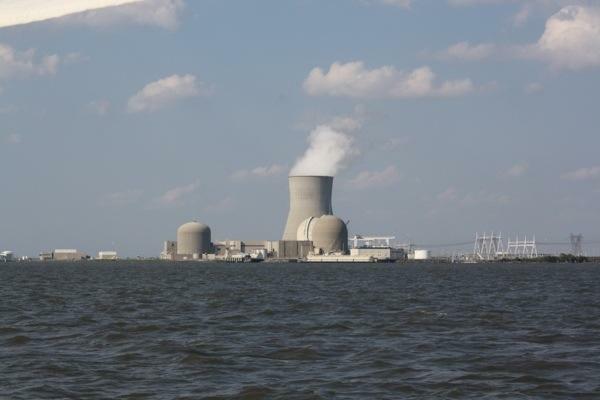 We also sailed past a Nuclear power plant. As we made our way farther up the bay the current kept pushing us faster and faster. By the time we were nearing the C & D canal we were doing a consistent 8+ knots! Unfortunately we picked up hundreds and hundreds of little black flies that thought it would be nicer inside our cabin than being blown around outside. When we finally realized they were sneaking in we put up the screens but it was really too late. I spent a lot of time killing flies this afternoon…and this evening. It turns out that going out of our way to catch the extra current paid off, and we arrived at the C&D canal just ahead of Matt and Jess. Stephanie took the helm and motored us safely through the canal while I went below and cooked up a chicken curry. Shortly after coming out of the C&D the sun went down and we were caught in a small thunderstorm. The rain came down in buckets while we motored for our intended anchorage. We arrived and dropped the anchor only to discover that the wave action was going to make for a very uncomfortable stay. We only stayed long enough for the lightning to move out of our area and then we picked up the hook, and headed across the channel to “cabin John creek”. The water is very still here and we are looking forward to a good nights sleep. 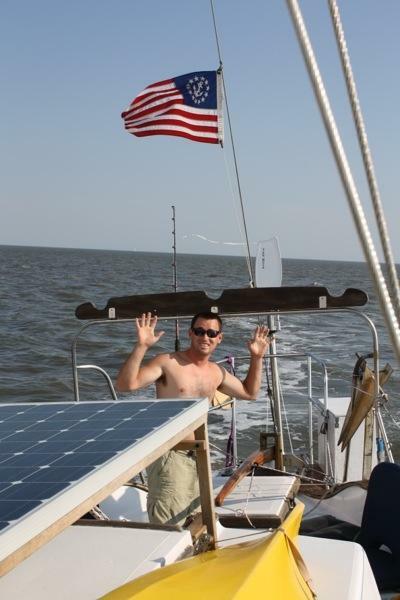 This entry was posted in Navigation and tagged buddy boating, C&D, canal, cape may, grandjean, maryland, navigation, new Jersey, Rode Trip, sights by Brian. Bookmark the permalink. What imaginary race? I was calculating the distance between us the whole time thinking I’d come out first! It was a great day on the water, but that storm at the end really sucked. Glad you also made it to a safe anchorage and also so glad we had the chance to meet!